There are not many microwave enthusiasts in North West Florida, or if there are many (more than me alone? ), I have not found them. 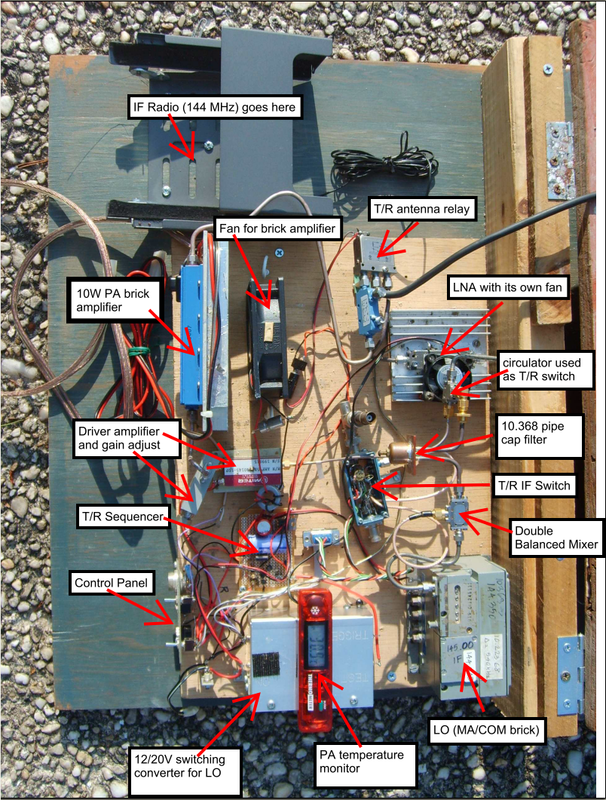 When I started talking about making a 10 GHz transverter at my local radio club, there were a few people interested, but nobody was interested enough, or had enough time, or enough material to actually consider building one. So I decided that if I were going to do something on 10 GHz, I probably should think about building two transverters, and I started thinking about everything in quantity of two. That means two VHF-SSB rigs, two microwave bricks, two mixers, two filters, two sets of relays, antennas and all the smaller stuff that is not easy to find, such as coax-waveguide adapters, SMA-BNC adapters and the like. One of the immediate advantage of building two transverters, aside from being able to have a QSO (with yourself? ), is that it is a lot easier to check out a radio (in general) if you have another radio operating on the same band and mode. Both transverters do not have to be at the same level of power and sophistication, and in my case, while both transverters are similar in concept and material, one is a high power unit with a significant antenna (10W into a 2' offset dish), and the other is a low power unit (~100mW) driving a small horn. The smaller unit draws low power and is easy to carry around, so it makes a handy monitor, even if you do not use it for QSO. The low power could probably do CW, but it is not geared towards sending CW efficiently, the high power unit is. Also, while the cost of building two transverters is obviously greater than the cost of building one, if you shop wisely and as I did, do not try to make two top-shelf units, the incremental cost of building a second unit for test and monitoring is not that great, and you will have a source of spares, should your main unit have a failure. The most significant cost was the IF rig. I already had an FT-290MK2, which is just about perfect for the task, but along the way I developed an interest in VHF/UHF operation, and the lowest cost for getting on the bands other than HF or 2m was an FT-817. So I bought a used FT-817 and started using it on 6m and HF portable, and it does a fine job as an IF rig also. Let's talk about the transverters themselves. There are many ways you can get on the microwave bands, 10 GHz in particular. One of the most obvious is to go out and buy a commercial unit from SSB Electronics or Down East Microwave. 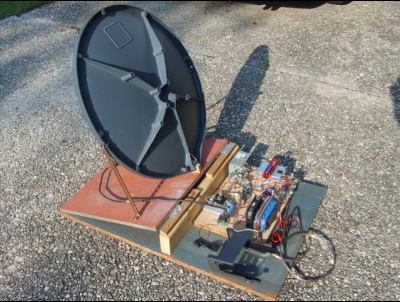 Another is to build a transverter from scratch from the articles in QST by Zack Lau W1VT. Finally, probably the most popular is to build one from surplus parts. If you select the 3rd option, eBay will be your friend, you will have a steep learning curve, you won't be the first one on the air, but you will have a lot of fun and lots of rewards in knowledge and satisfaction. With regard to not being the first one on the air, my transverter building experience was almost 10 years in the making, from the time I bought the first components, the microwave bricks. If you are in a hurry, check the links at the bottom of this page. The IF rig I normally use with this transverter is a Yaesyu FT-290MK2. It is settable to high power (25W) and low power (5W). I use it in the low power mode of course. To drive the mixer in the linear region, you need not more than 1 mW (0dBm) in the IF port. That's what you will need for SSB. For CW, you could run 3 to 5 dBm into the mixer and get a little more output power. To get 1 mW, I had to attenuate the signal level by about 37 dB. I achieved this by using an OEM attenuator pad rated 5W and 30dB, and provided the additional attenuation by placing R1 between the attenuator output and the mixer. R1 is adjusted to get just the right drive level. See notes for tips on how to adjust levels. You might think resistor R1 provides additional losses in receive since it is not disconnected from the IF port of the mixer. This is correct, but since it's value is about 300 to 500 ohms, it is less than about 1dB of loss, which is perfectly acceptable, at least as long the LNA has sufficient gain. Before I had the logic right, I did transmit 25W into the attenuator (instead of the 5W it was designed for), and the mixer survived, so R1 and the protection diodes did the job. YMMV. For mixers to operate per specification, it is very important to properly match impedances on all ports, not only at the operating frequencies, but at all frequencies where the mixer can generate energy (mixing products, harmonics). This is very hard to do in practice, but it is not really necessary for narrow band ham applications because we typically have a narrow filter in the output path (the pipe cap filter in my case) and we seldom deal with a lot of signals, even though those who have to share a mountain-top with cellular and other wireless carriers may disagree. Also, we are not overly concerned over distorsion, unlike the OEM comm people who run high bit-rate modulation schemes and have stringent channel spacing requirements. The DC/DC converter providing 20V for the brick oscillator has extensive shielding and filtering. This is necessary to prevent switching noise from getting into the IF rig. Also, the converter is using a now obsolete Motorola boost controller IC with built-in, non adjustable current limit. It turns out that because the brick oscillator draws more current when cold, and the switching regulator draws more current at lower input voltage, when everything was cold, the converter would not start. So I had to add a delay circuit to let the converter ramp to 20V before the brick oscillator would start drawing current. If anyone is interested, I'll be glad to add the schematic of this circuit. There are a couple of unusual details about the design of this transverter. To prevent transmitting directly into the mixer with the full power of the IF rig, the IF T/R relay that switches the attenuator (used in transmit) in and out (K1) also routes the signal that enables the transceiver to transmit. So if wired right, the transceiver cannot go into transmit unless the T/R relay is in the *attenuated* position. This is very simple and reliable. To prevent transmitting if the antenna switch is in the Rx position (which the PA brick would not appreciate), the Tx enable line is also routed through a spare contact on the antenna switch itself. Therefore, if the antenna switch is not in the Tx position, the PA is disabled. This was made easier by the low level PA Enable line on the particular brick I am using. I am a firm believer in belt and suspenders when expensive hardware is concerned. At the right side (looking at the schematic above) of the 10.368 filter, I use a circulator instead of a microwave relay to route the signal between the driver amp's input and the LNA's output. Circulators have a little more loss than a relay, but they do not require a control signal, and this device provides matching between the filter and the amplifiers (the pipe cap filter is highly reflective outside its narrow bandpass, which could lead to stability problems, if the LNA has high gain). For this to work, the LNA and driver amplifier should not be powered at the same time. K2's job is to make sure that does not happen. Note that the antenna is mounted on a hinged piece of plywood, so I can easily adjust the elevation. The semi-rigid cable connecting the antenna is flexible enough to give me 20 to 30 degrees of range. Both transverters are essentially the same, with the important difference of the 10W brick amplifier (I was lucky to find one, I do not expect that luck to repeat itself). Also, the *big* unit has a 2 foot offset dish (with probably ~40dB of gain), the small unit has a small horn with about 15 dB of gain. The small horn was made with brass sheets and a short length of WR-90 waveguide and a flange. I do have a Ku band satellite dish that my neighbor trashed, and I anticipate using it with the small transverter. Finally, the DC/DC converter powering the brick oscillator does not have the same shielding and filtering as the other transverter, so that unit is a little noisier in the lower HF bands, even though the noise does not extend to the VHF range..